The dark lane in the 3628 is really fantastic! Before this sketch, I always confused M65 and M66. But now I can classify 65 & 66. This is a close gropup of seven galaxies that lies about 480 million light-years away in Leo, discovered by Ralph Copeland in 1874. An apparent magnitudes of them: between 13.6 and 15.2, it was hard to divide, They are very faint even in Newtonian 16” + ES 14 mm in power 128X. The Biggest Face in the Universe! Seeing many objects in an eyepiece view is my favorite things! So, I love galaxy groups. M84/86 group like face shape. It is biggest face in the universe! Location: Negev desert, Israel, ~6.8 mag. sky. Instrument: 250mm F/5 Newtonian, 13mm Vixen LVW and 6.7mm ES82. Media Graphite pencil sketch on a white paper. Inverted and processed in Photoshop. Greetings to all visitors of this page. Object Name: Hydra Cluster or Abell 1060. Location: Capitán Sarmiento, Buenos Aires Argentina. Media: 2H, 2B, HB. Blend stump. Photoshop. Telescope: Meade LB 12″ on equatorial tracking platform. Eyepiece: Explore Scientific 11mm N2 82º. First star party of the year and first non-digital sketch. Hope you like it! Material used: graphite pencil on white paper. Inverted image and processed with Photoshop. Conditions: NEML: 5.9, Temp. : 10° C.
One of the most popular “challenge objects”. If you want to observe this objects, one thing is very necessary – clear dark sky. Why? 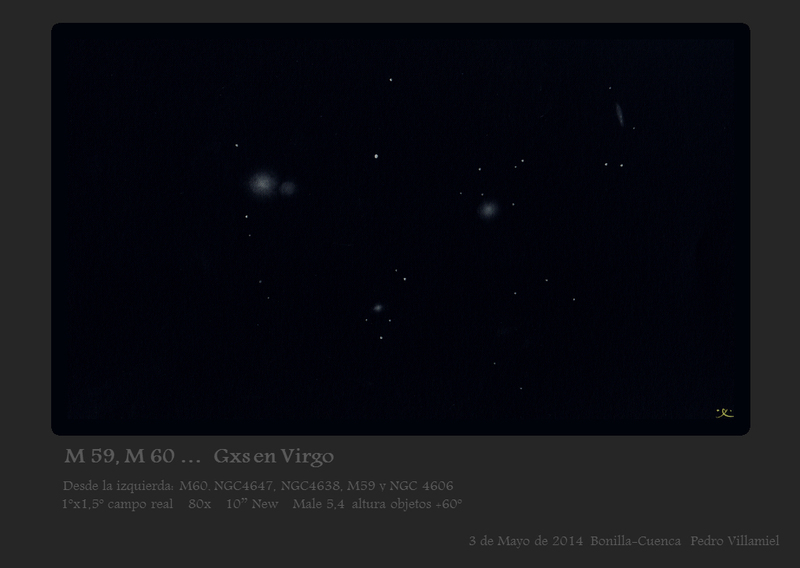 This objects are vey faint so good contrast between galaxies and sky is the most important thing. After few minutes of eye adaptation you can observe four very faint galaxies on the longest side of triangle of three bright stars (it is quite easy to find because it is near very bright galaxy NGC 7331). Very interesting objects – you must have it on your observation list under really dark sky. I usually sketch in some detail at the scope (mainly HB and 2B). I then scanned the result into Photoshop and sharpened the sketch. 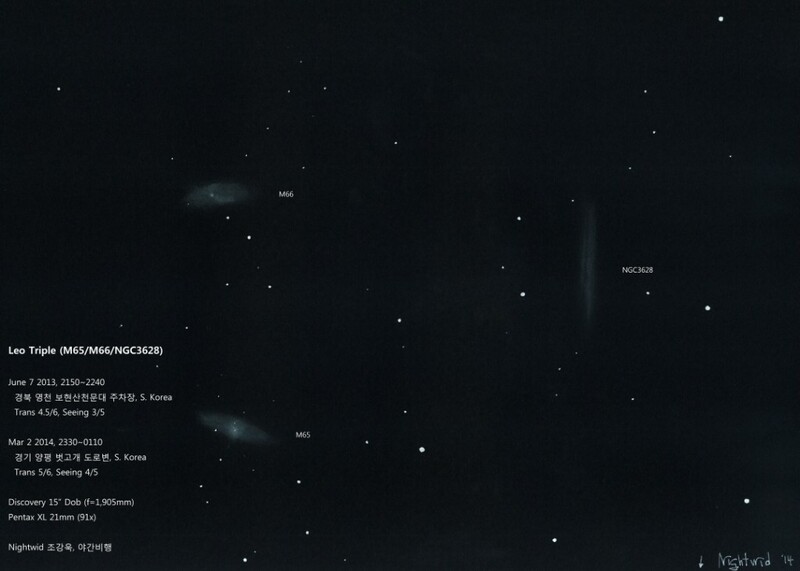 I annotated the galaxies. 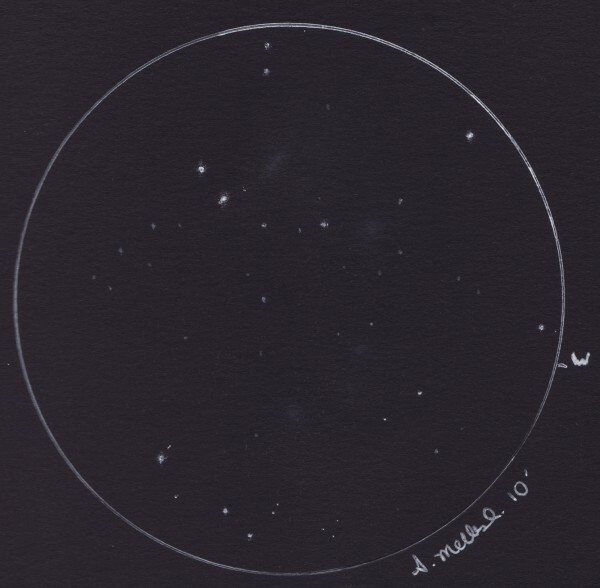 For this sketch I used a Nexstar 8SE teamed with a WO 32mm wide field of view eyepiece. 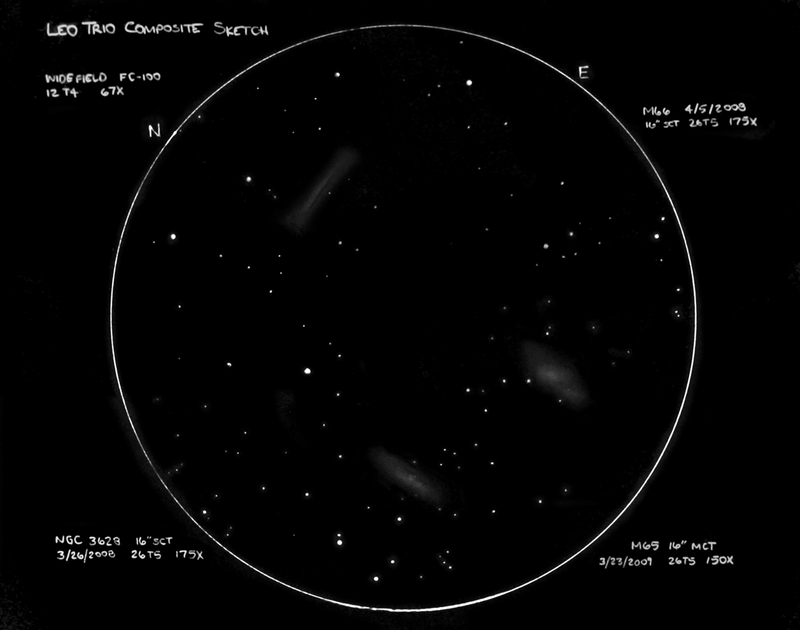 The sketch occupied two eyepiece field of views plus a bit of edge fills for some surrounding stars. 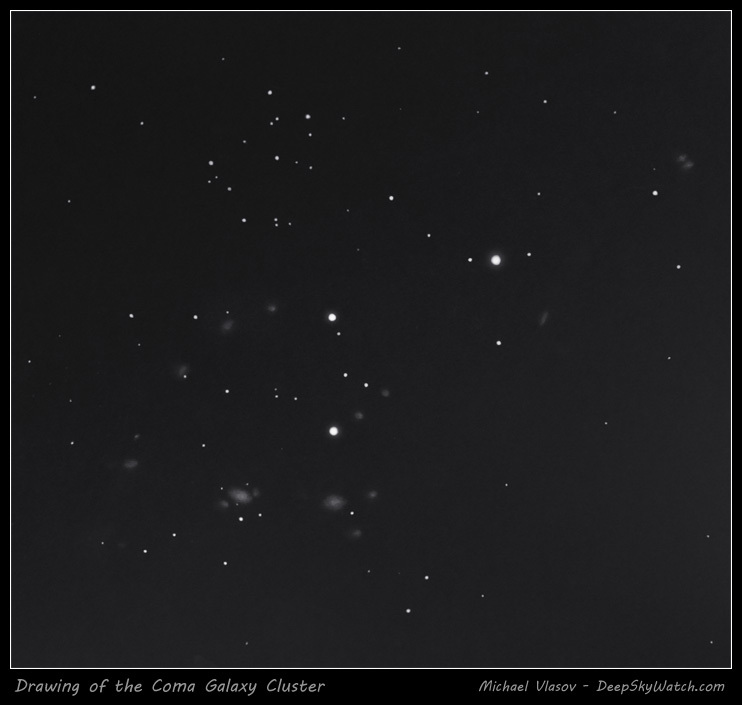 I have wanted to sketch this cluster for a very long time but needed to travel out into a dark sky site to have a chance. 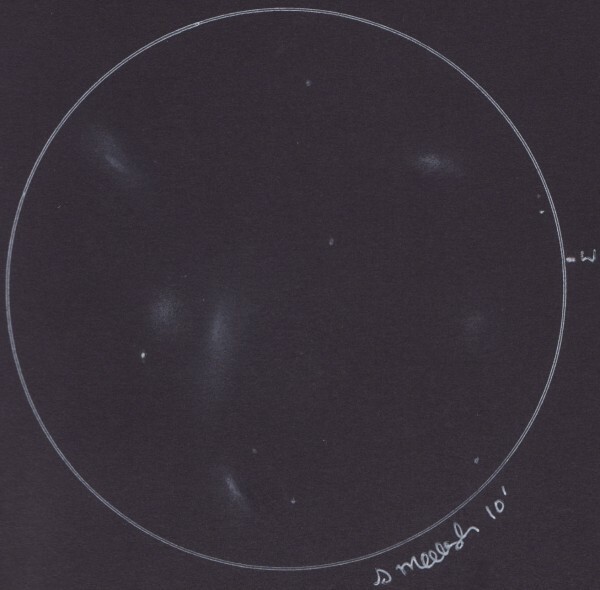 M84 and M86 were very noticeable but, with the help of a star chart I was pleased to spot many more than can be seen from my back garden, although NGC 4413 required averted vision. on the night of 07th on the 08th May, I had good conditions: no wind, warm temperatures (about 14°C) and clear sky. So I observed the area between Bootes and Ursa Major till midnight. 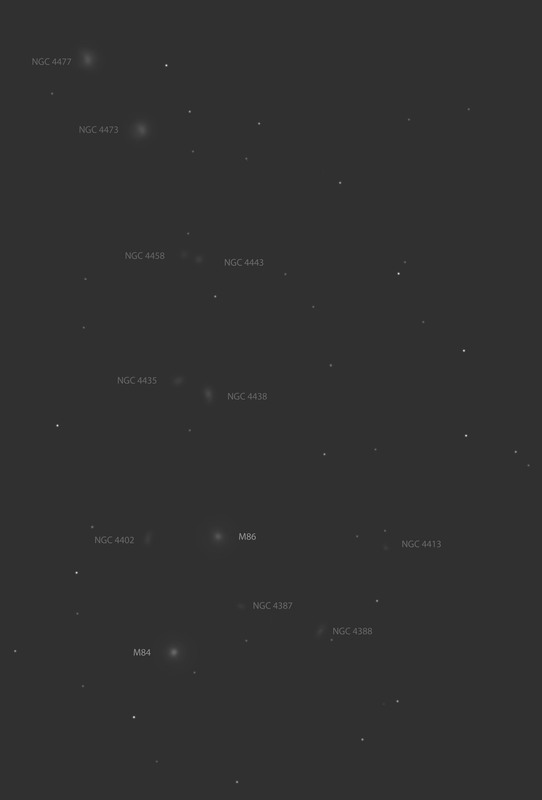 After lot of nice galaxies I steered my telescope to Hickson 68. The Galaxies around NGC 5350 in the vicinity of a pretty yellow and blue double star are a great few. Only the faintest galaxy NGC 5358 was imperceptible. 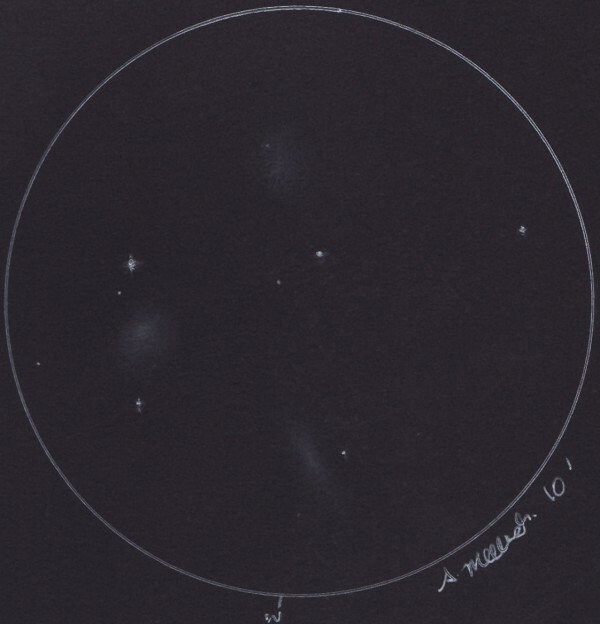 After 20 minutes I had placed the stars and the galaxies NGC 5350, 5353, 5354, 5355 on my sketchpad. 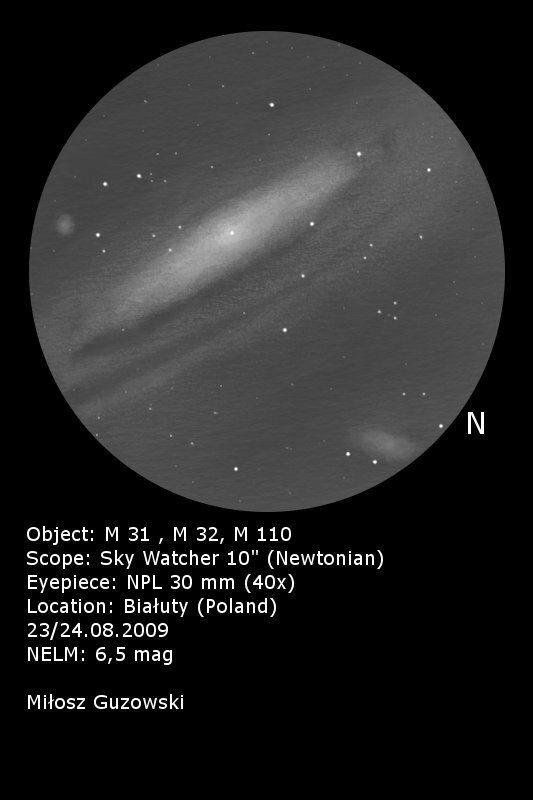 It was one of the nights where I enjoy working with the Deep Sky observers Atlas by Gerhard Stropek. I traveled from galaxy to galaxy and simply enjoyed the light of the stars. And so I hope that you like my sketch. A clear evening sky with the moon not rising until around 11pm local time saw me out in the observatory with Hickson’s on my mind! My targets were to be 97 & 98 which are found in Pisces just below the bottom right hand corner of the great square of Pegasus. I engaged in my usual process of ‘star hopping’ the scope from rest position to my target. The smaller the hops, with ‘re-syncing’ at each stop the better my chance of hitting small and faint objects. 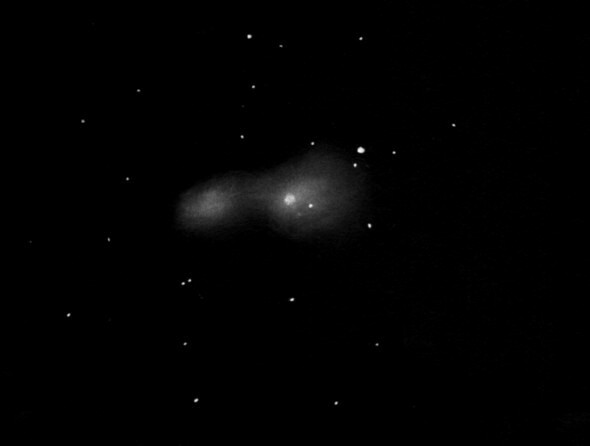 …Hickson 98 listed as having NGC 7783 as a searchable member my software database told me it wasn’t listed, so I had to slew the scope manually onto the coordinates given and then search for a suspect galaxy group when I got very close, this didn’t turn out to be too difficult and I soon had the 4 members forming a chaining with a few stars on the monitor screen. A star bright enough to display diffraction spikes headed the chain to the north, all very neat and attractive. It turned out that all 4 members are NGC 7783 A-D so that is likely why I could find it; I probably needed to enter the full nomenclature to find it in the database. 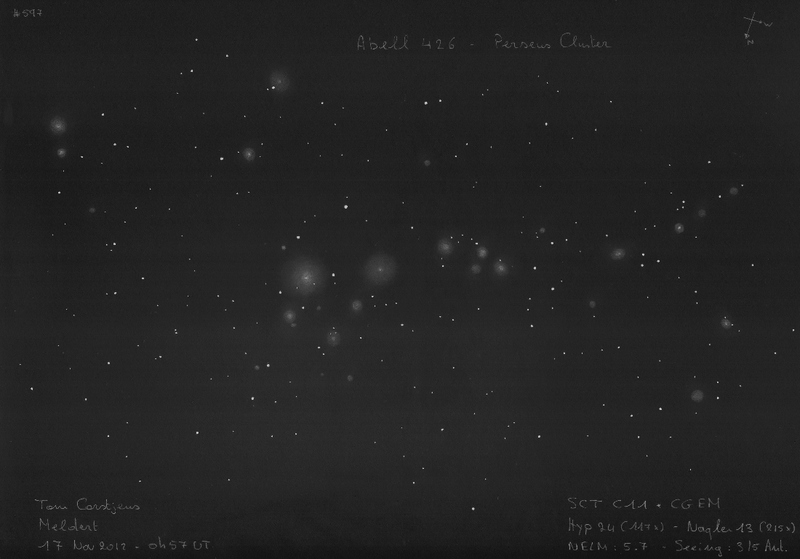 More than 25 individual members of this impressive Galaxy Cluster could be observed in a rich Perseus milkyway starfield and were recorded on this sketch during a timespan of more than 3 hours. In particular the area around the massife Seyfert galaxy NGC 1275 was a visual adventure with faint galaxies popping up in the eyepiece! A brief window to observe the deeper sky was taken tonight as it was clear, dark early and with the moon not due to interfere until around 20.30ut. 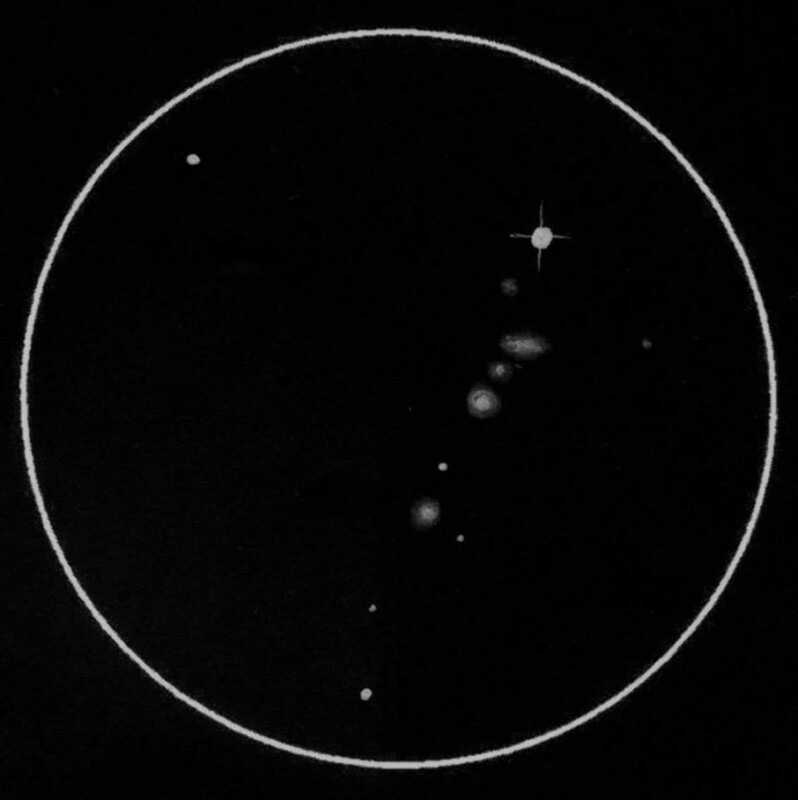 As has become the norm, I was intent to grab another of the 100 Hickson groups, but before I did this and as Altair (Alpha Aquilae) was a stop off on my hopping progress up into Pegasus I took a look into Mark Bratton’s excellent Guide to the Herschel Objects to see what was local. I picked up on NGC 6781 which is a beautiful mag 11.8 planetary in Aquila with plenty of exquisite detail to enjoy. 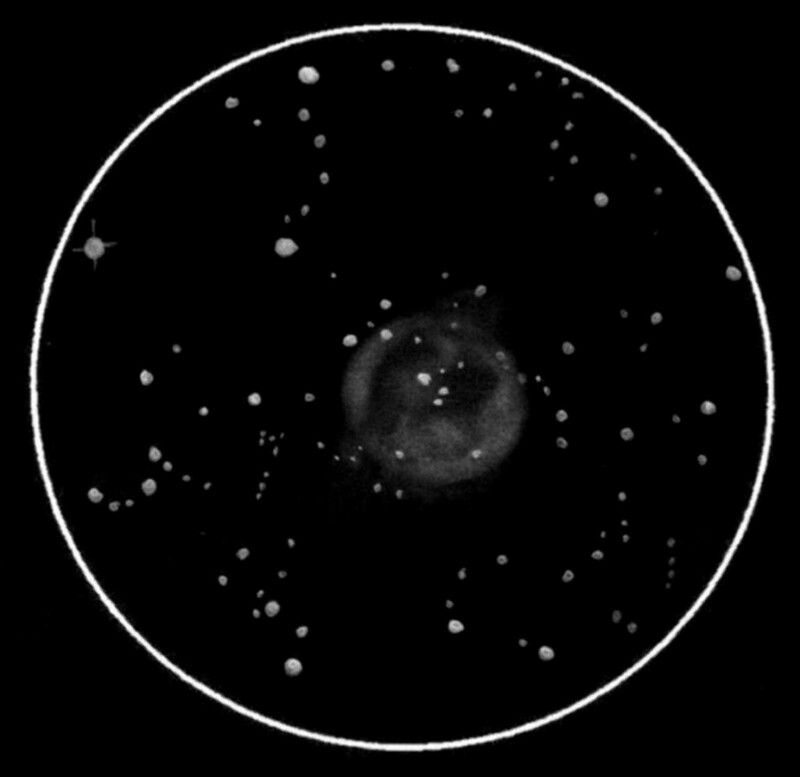 Compared to M57 the Ring Nebula in Lyra it is relatively large and faint, yet not so faint that it isn’t visible in smaller, say 8” telescopes, I feel it is more akin to the Helix nebula, though considerably smaller at 2.0′ diameter. 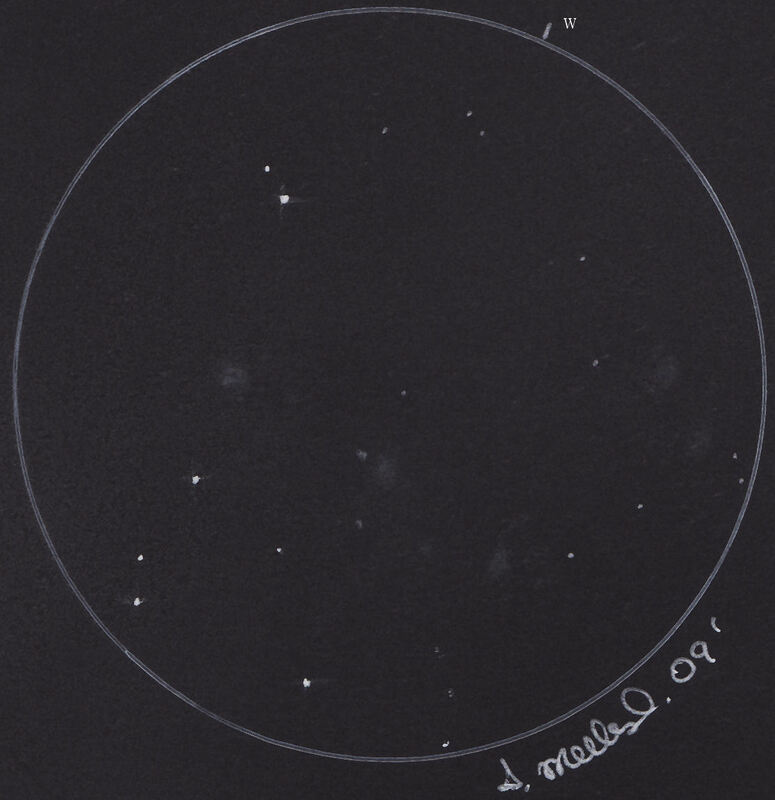 At 16.8 magnitude, the central star (a white dwarf) is clearly seen just off centre in my sketch, made using the 500mm mirror, Watec 120N+ video camera of course! Sketched in pencil on white and then inverted on the computer. 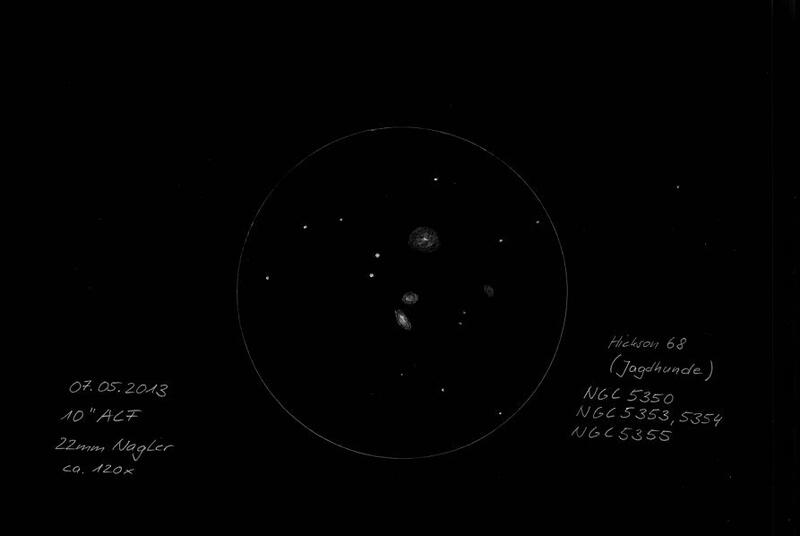 No time to spare, one sketch in the bag, yeeha!, with the Moon getting ever closer to the horizon, I pushed onto Hickson 99 there are 5 members in this group which is located just SW of Alpha Andromedae (Alpheratz) in the square of Pegasus. (A) member UGC12897 mag 14.8 is extended N-S with a star on its southern tip. (B) UGC12899 is round fairly bright at mag 14.7 with a brighter nucleus. 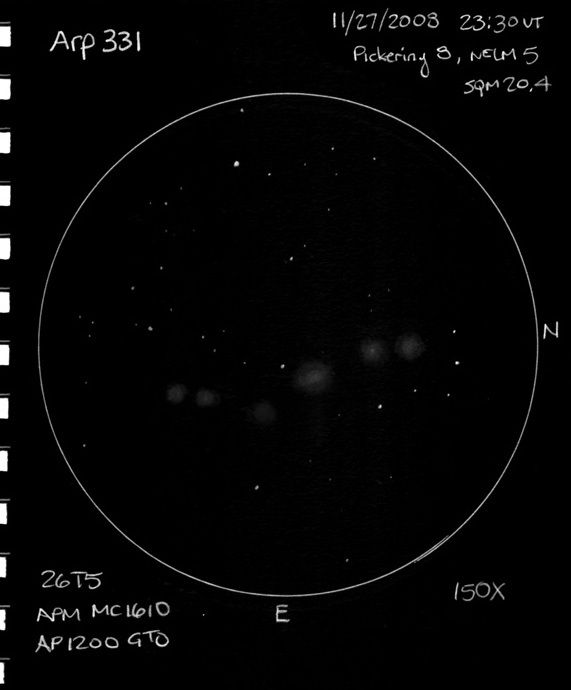 I find (C) PGC 58 to be the most interesting, it is a barred spiral and despite being only mag 15.6 I was able to see and capture arm structure in my sketch, amazing J (D) & (E) members PGC 60 & PGC 57 respectively at mag 17.1 & 17.6 are merely tiny smudges to the south of the 3 main members. I was very pleased with this short and productive observing session, time to close up and return to the family & gardeners world indoors! NGC 4889 is the brightest galaxy in the Coma cluster. The view one gets in a larger telescope (I used an 18″ f/5 Dobsonian) is stunning. At least a dozen galaxies could be seen definitely, several more were assumed. The field almost showed as many galaxies as stars. NGC 4889 itself is pretty bright with a significantly brighter nucleus, slightly elongated in WNW-ESE. Sky conditions were good but not perfect, I logged a faintest star of fst 6m4 in Virgo. The magnification of the sketch is 94x. Beside the observation the identification of all seen galaxies was quite demanding. Hopefully, they are all correct. 28 is 28 & Cleopatra had her beautiful eye on me! Quite how I came to observe the next object I’m not quite sure? I may have noticed it close by on my planetarium software, not that it matters, it was an interesting and valuable observation. Again in Eridanus, NGC 1535 is a lovely planetary nebula, named ‘Cleopatra’s eye’ by Greg Crinklaw aka ‘The Skyhound’ a name that appears to have stuck and grown in popularity. I had observed this planetary back in 2010 with the old 350mm F5 and older first generation Watec camera, but this was my first visit with the 505mm mirror. It did show an improvement, despite the lower focal length employed on this occasion, I used a barlow lens previously to increase image scale and try and pull out more detail, I had failed to resolve a faint star on the very northern edge of the nebula, the central star was easy and steady as were internal annular ring structures rather like those in the ‘Eskimo’ nebula. Here is my old sketch with the 350mm and here is the latest with the 505mm. At the time of writing I have asked Sue French if she would be so kind as to help assist me on finding the outer stars mag. 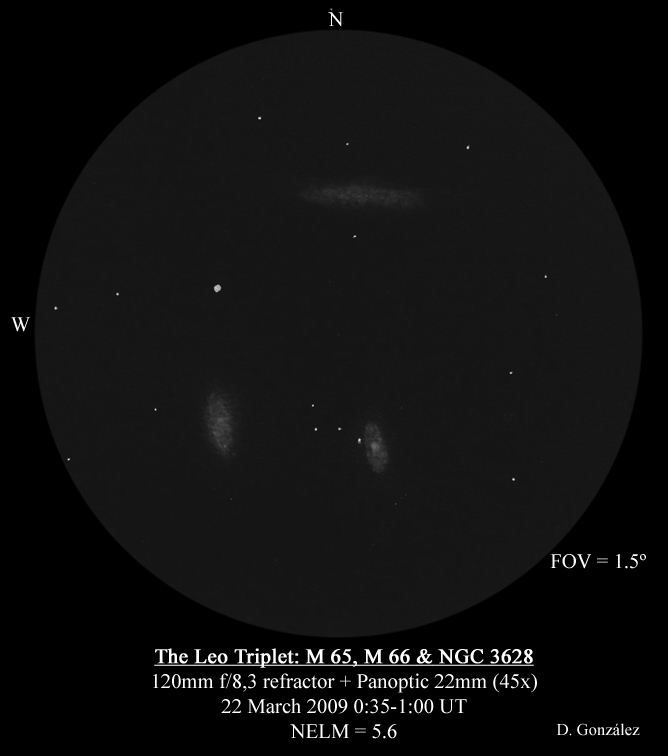 The Leo Triplet – three galaxies M65, M66, and the NGC 3628. 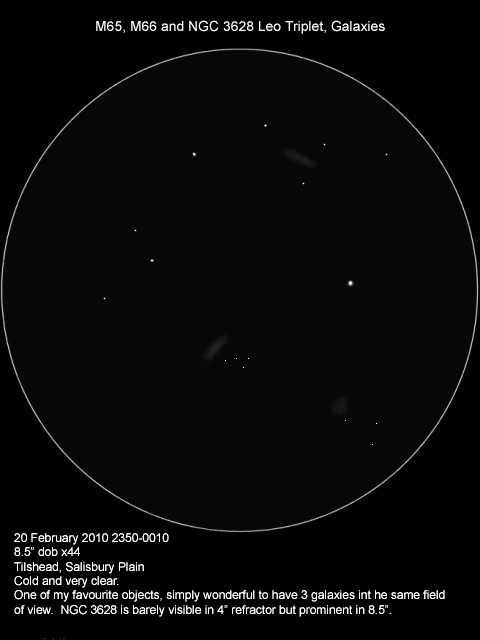 March 6, 2011- I saw them in SCT 11″ (power of about 70x), in the Swan 40mm, with field of view 72 degrees ! The NELM was about 5 mag, sky was very clear. These objects like magnification, if we had used it, the Triplet would have shown us a lot of details. 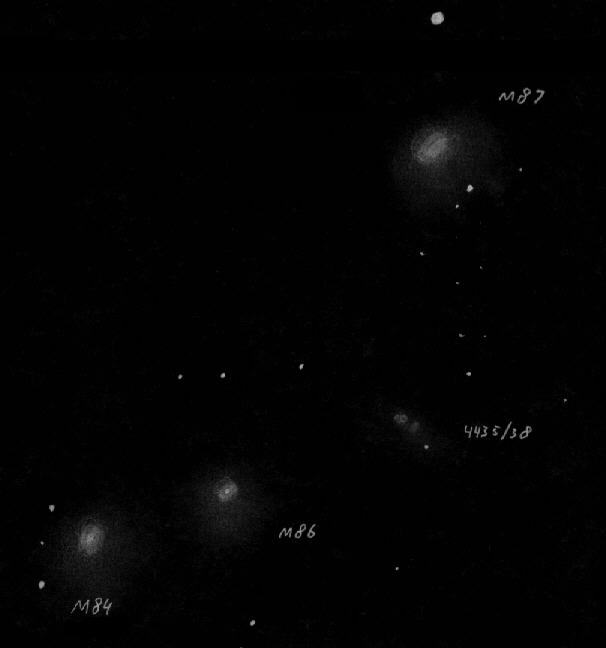 This was quite a nice collection of galaxies in Gemini that viewed well in the 56cm dob. 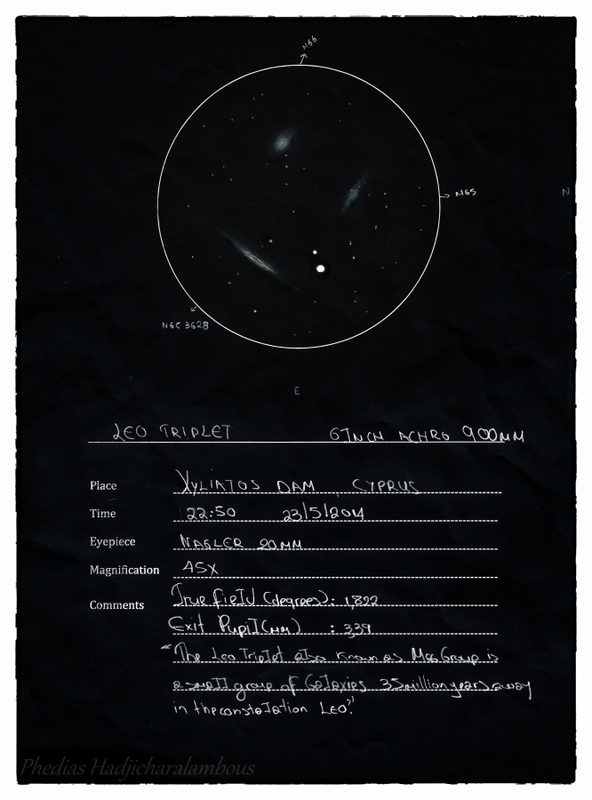 The brightest member of this group is NGC 2294, as is quite evident in the sketch. quite faint and small galaxies NGC 2289/2288 which are only some 2′ apart. The last object in this group is NGC 2290 another diffuse mag 14.0 galaxy about 1.0′ x 1.0′ in size. This was a fairly faint group, but they were not overly challenging from a dark sky site. From the Realm Of The Nebulae comes this interesting trio of relatively bright galaxies. Deep images show that these galaxies are interacting, with the dominant member being NGC 5566.
and shows them in all their glory. Though I would have to say that sketching materials are a lot less expensive than fitting oneself of with CCD gear. 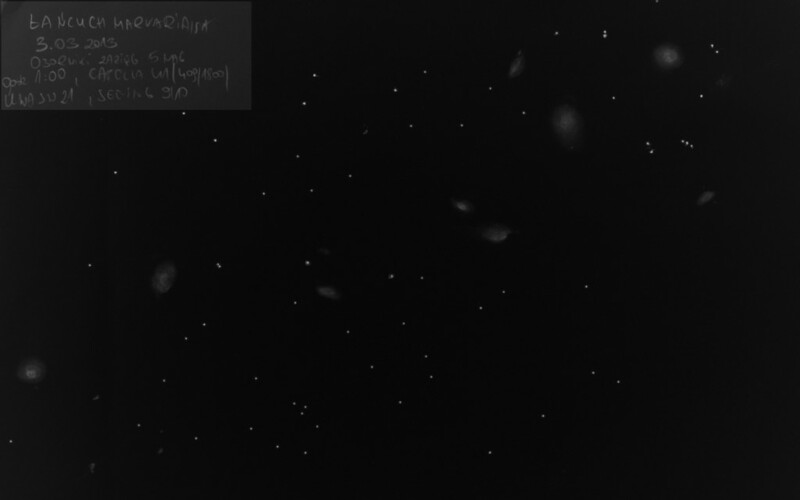 This lovely little chain of four galaxies was easily visible in the 56cm dob. Though small all of them were fairly bright at around mag 12.5. Quite a number of the Hickson galaxy groups are faint and challenging objects. This group however was a pleasant surprise. a few more objects off my observing list. and I marked them down for observation. together in the one field. I have included a duplicate reference sketch with details. Hopefully I have got all the designations correct. 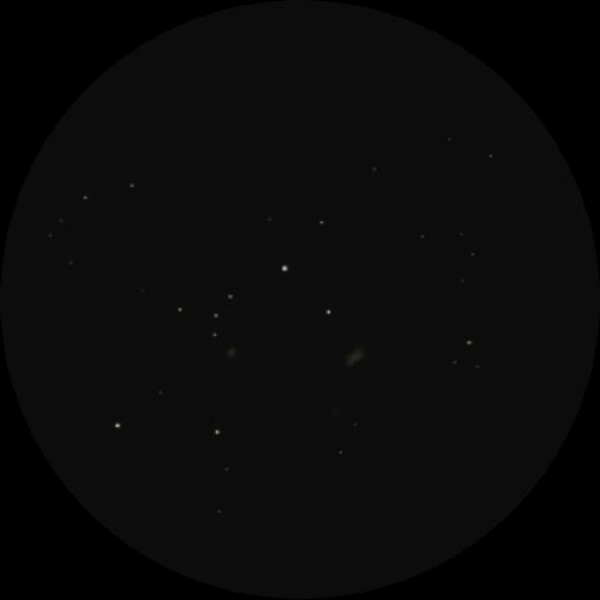 This sketch of the chain of galaxies that runs from M87 to M84 was made with an 8″ Dobsonian at 49X and shows M84, M86, M87, NGC 4435 and NGC 4438 while at higher magnifications NGC 4387 and NGC 4388 were also seen near M84. This is a wonderful area of the sky with medium sized telescopes. The sketch was made with pencil on white printer paper. It was then scanned into the computer and inverted to give the realistic white-on-black look. First, I’m a French man so sorry for my bad english! 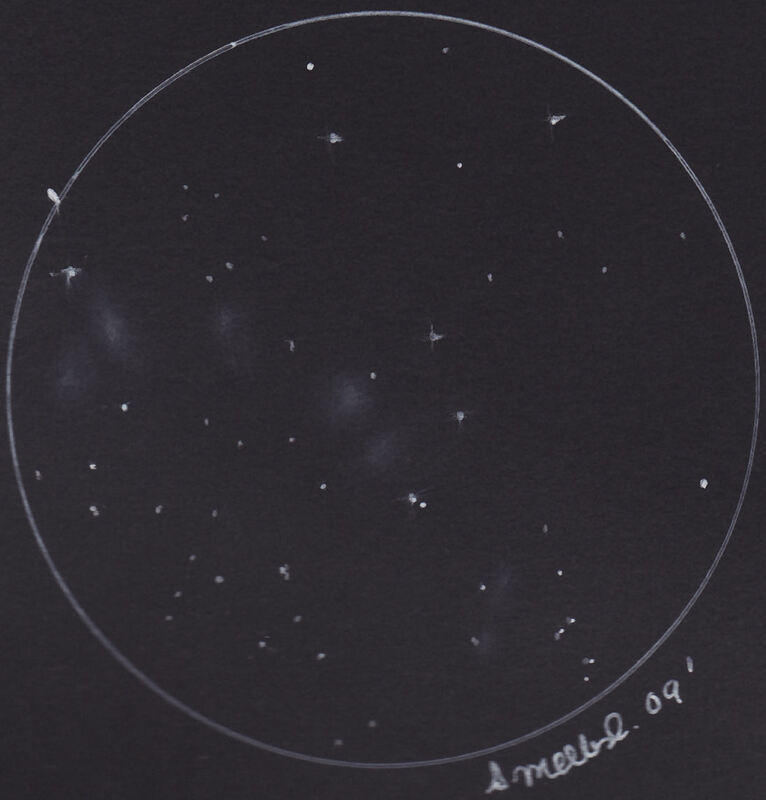 This sketch was drawn with a refractor telescope 3.2″ APO (80mm) with a 25mm eyepiece (24x,) on azimuthal mount in Italia during my holiday. About the seeing and the transparency, I noted a seeing of 3/5, a transparency of 2/5 and a light pollution of 2/5. Thus, the sky was very good because I was in the campaign. The sketch lasted three hours and forty five minutes, from 21h45UT till 1h30UT. 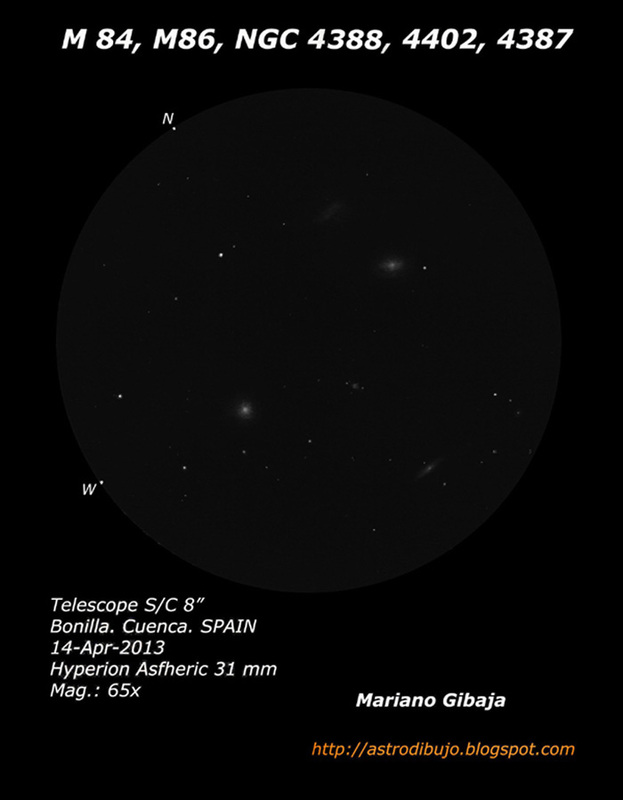 In the eyepiece, there were ten galaxies which three very bright as M84, M86 and M87! 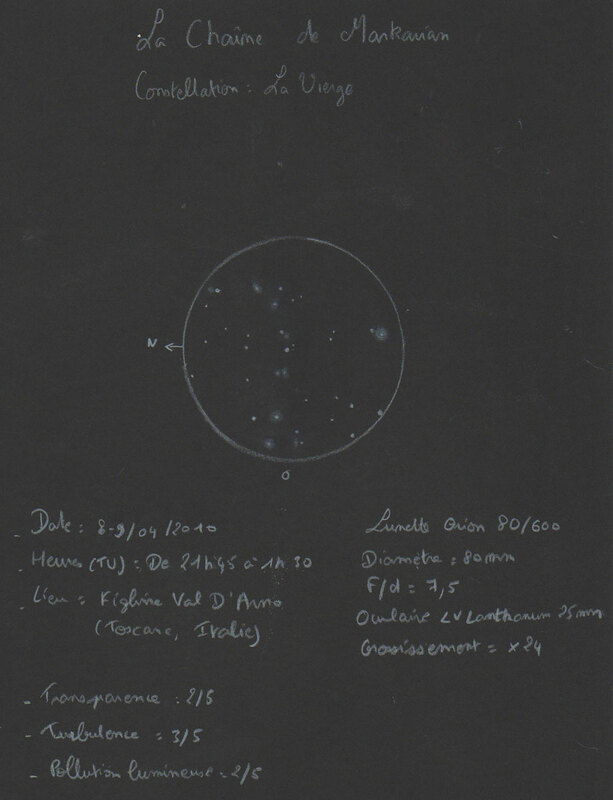 Attached, two versions of the same sketch, one right and one annotated with the name of galaxies. 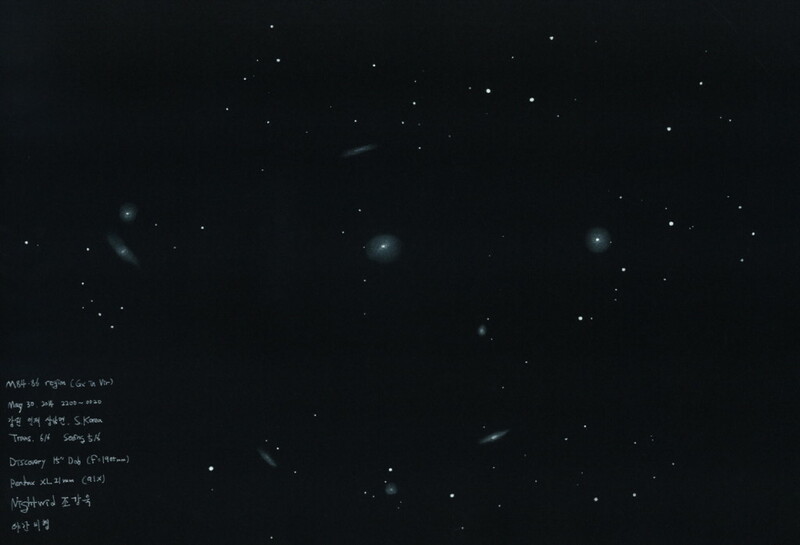 Object Name Markarian’s Chain (M84, M86, NGC4388, M87, NGC4438, NGC4435, NGC4473, NGC4477, NGC4459, NGC 4461). 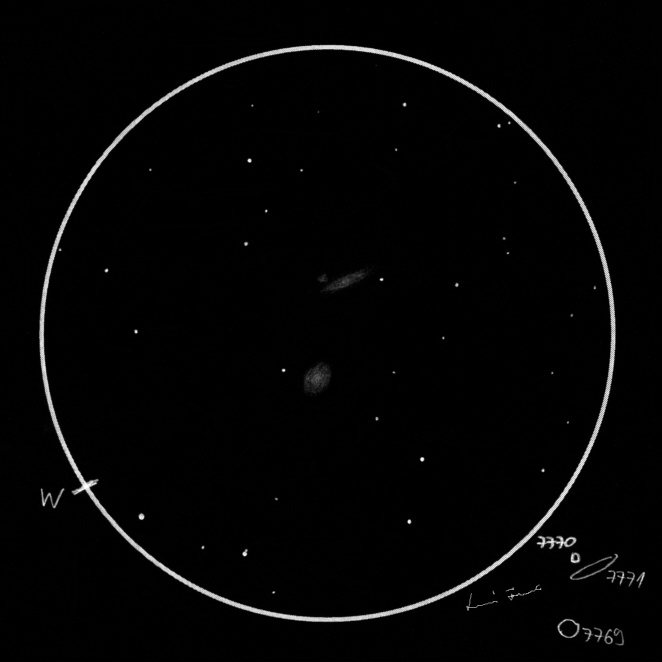 Please find a sketch of the Leo Triplet (M65, M66 and NGC3628) attached for your consideration. It was made at my dark sky site in southern England through a recently completed homemade 8.”5 Newtonian. 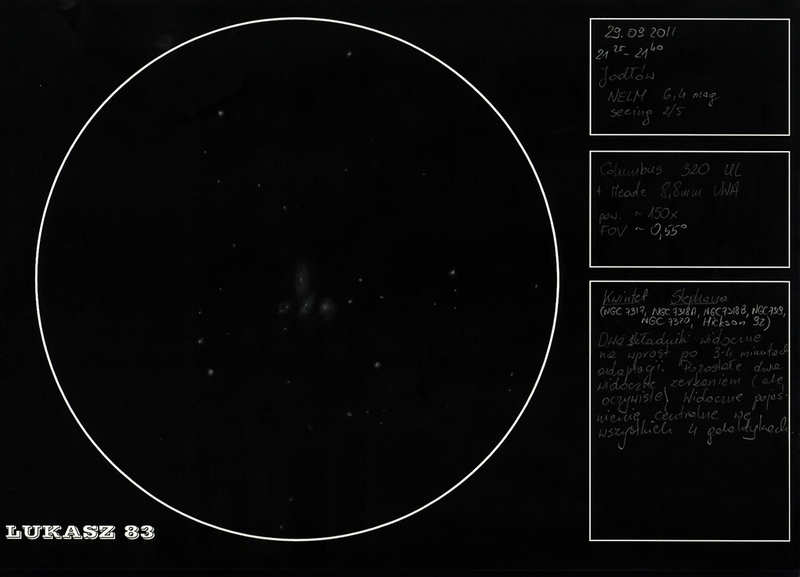 It was a pleasure to find the third galaxy, NGC 3628, readily visible when compared to the view through my 4″ refractor. When you consider the volume of stars in each galaxy, it is wonderful to be looking at three galaxies in the same field of view. The sketch was made using HB & 2H pencils and blending stump on to white paper and then recreated in Adobe photoshop. today I want to present my sketch of Deer Lick – galaxy grup from Pegasus. 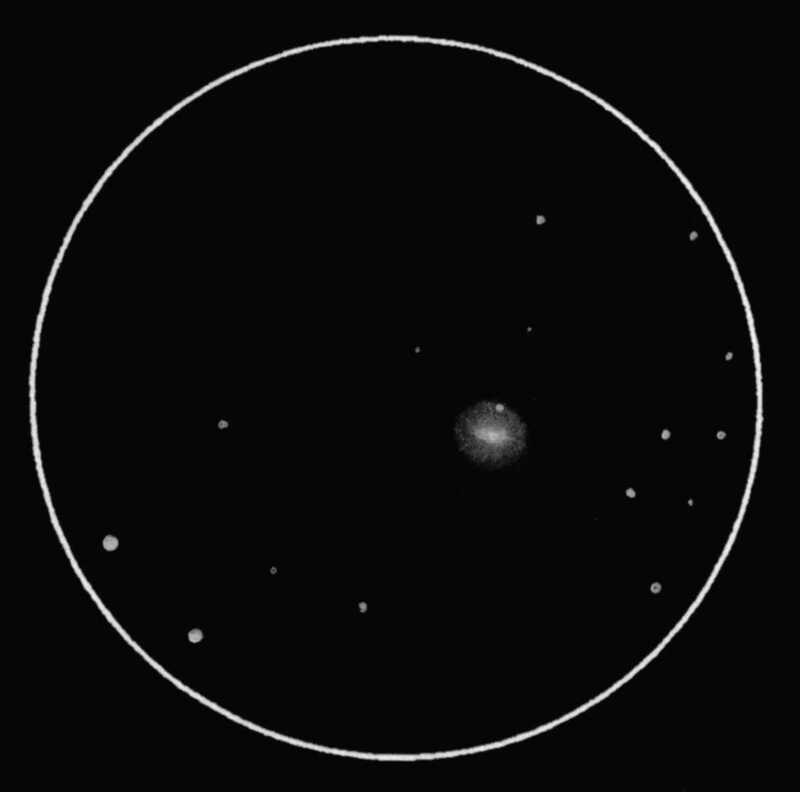 The far southern circumpolar constellation of Octans is not often considered rich in deep sky objects, at least not bright and pretty ones. For the more adventurous observer there is a wealth of faint and fascinating galaxies scattered throughout the area to keep one engrossed for hours. One such object is the remote Abell galaxy cluster AGCS 1014. R.A: 22 23 47.9 DEC: -80 11 52. This object is the most interesting of several extremely faint galaxy clusters that inhabit the region, and certainly the brightest one that is nearest the south celestial pole. What is most rewarding with such little known objects is the fact that the observer may very well be one of only a handful of people on the planet to have seen it in a telescope. 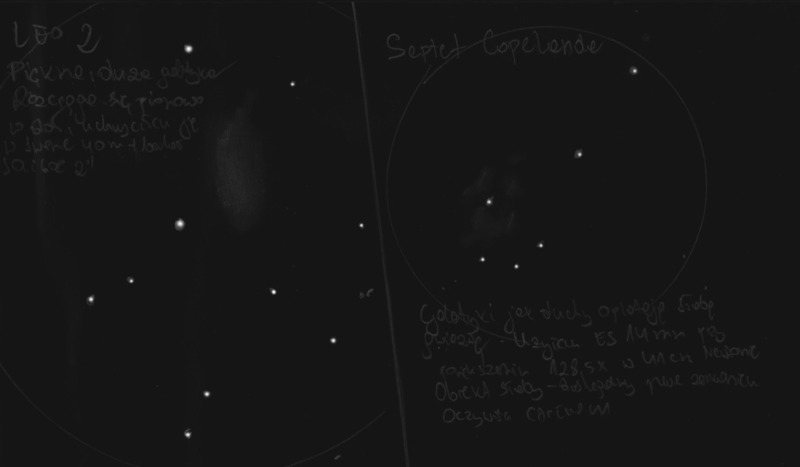 I’ve sketched this fantastic trio of galaxies during the Meteor Star Party 2009 in Tarján, Hungary. The two larger ones are the face-on NGC 7769 and the edge-on 7771, both with softly brightening cores. Next to 7771 a small fuzzy object is visible, which surprises me, since my printed star map (TriAtlas B, with a limiting magnitude of about 12) shows no other objects than the two large galaxies at this area of sky. But as I can clearly make out this bright diffuse spot, I place it on the sketch and can’t wait to find out what I really saw. 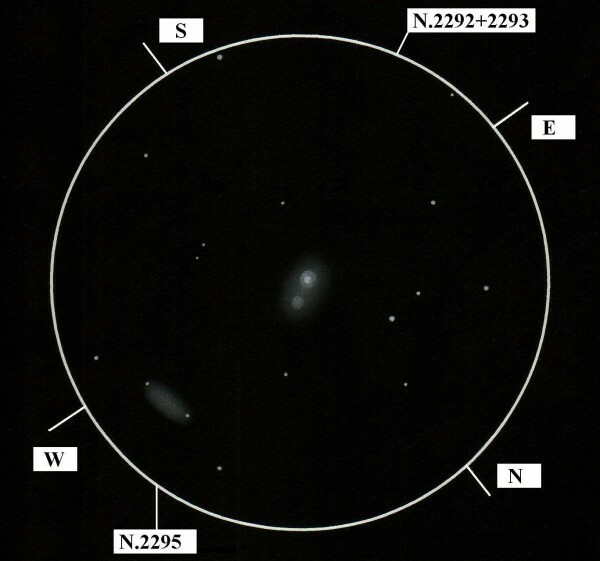 It turns out to be the NGC 7770, another faint galaxy of 13.6m. This value I find a bit misleading, because visually its surface is not this much fainter than its two larger companion galaxies. This discovery makes me really happy, just like when I rediscovered NGC 5981 of the Draco Trio. SQM reading: 20.91 m/arcsec^2. This has always been a nice collection of galaxies to visit in Pavo. Hopefully I have got all their designations correct. This is my first submission to ASOD although I am a long time reader of the website. Here is an sketch and small report of the Leo triplet I made last spring from my home in cloudy northern Spain. The Leo Triplet is easy to find south of bright star Theta Leonis. 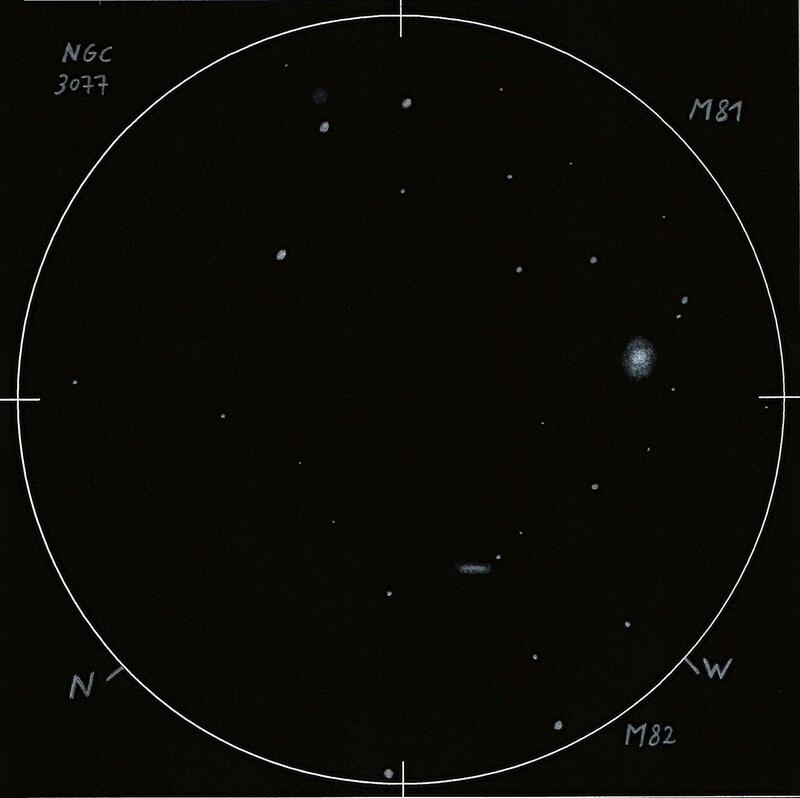 M 65 and M 66 are seen without much difficulty south of a 7th magnitude star, but under my sky conditions NGC 3628 requires more attention. M 66, the easternmost of the Messier galaxies, lies next to a group of four stars ranging from 10th to 11th magnitude. 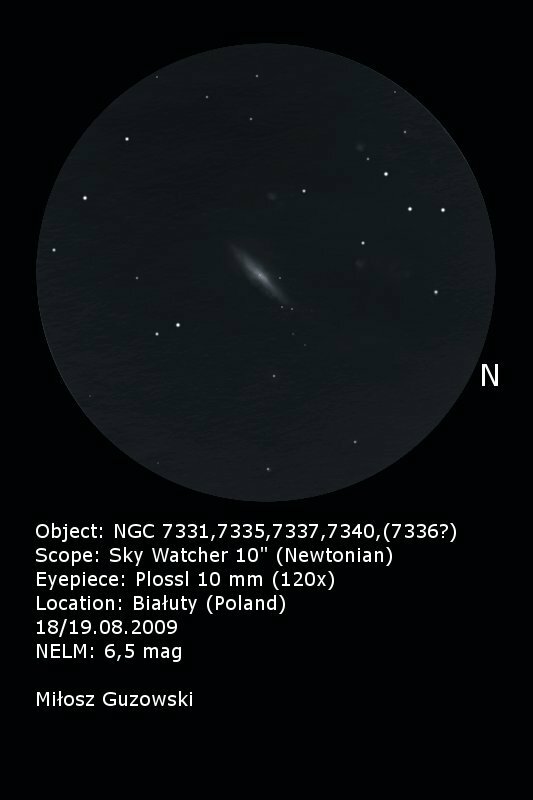 The galaxy has a bright nucleus and an elongated halo running NNW-SSE, small and well visible, that is gradually lost in the dark sky. The other Messier galaxy, M 65, has an orientation and size very similar to its companion, but its look in the eyepiece is different. I canâ€™t see a prominent nucleus and the brightness seems rather uniform but increasing slightly towards the center. NGC 3628 is a bit more difficult than its companions, and I need 45x to make it visible, although the best view comes at 77x (Hyperion 13mm eyepiece). The galaxy is a faint spindle, very elongated in E-W direction. It is noticeably bigger than the Messier galaxies and creates a beautiful contrast with them. Using my Panoptic 22mm eyepiece, I can see all three galaxies in the same field of view, making it a wonderful view. 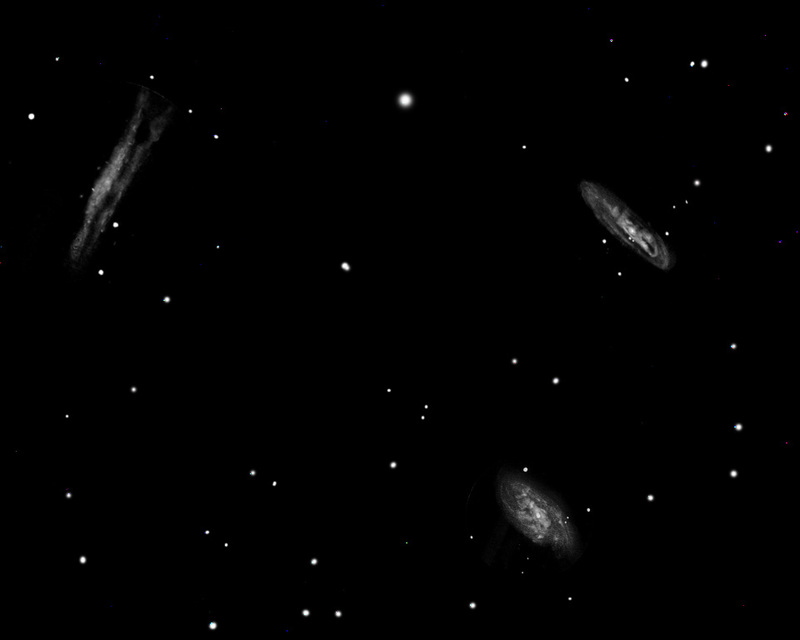 The three galaxies are Hubble type Sb, but each one has its own features that make it different from the others at the eyepiece. The average distance to the Leo Triplet is about 30 million light-years. 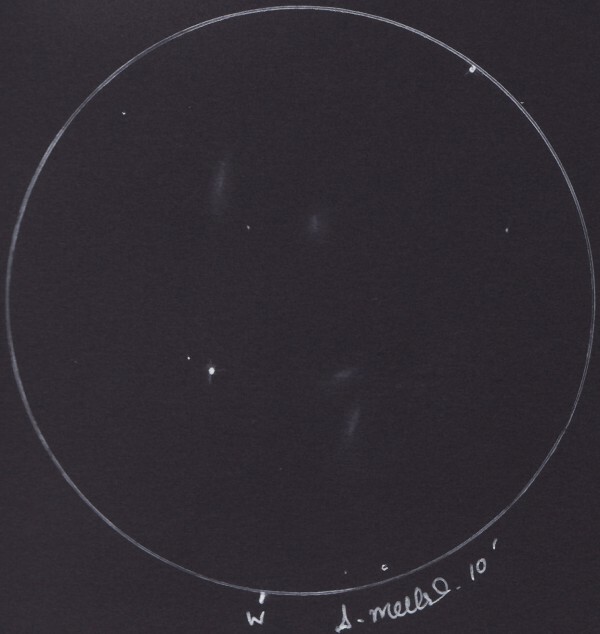 This is a large-format sketch of the Leo Triplet. The field stars and galaxy positions were drawn from observations through a Takahashi FC-100 at 67X, while the individual galaxy details are from 3 separate sketches through 16” cats (M66 and NGC3628 through my old Meade SCT at 175X, and M65 through my newer APM Mak at 150X). I scanned the original sketches and increased the contrast, and then printed them to the same scale. 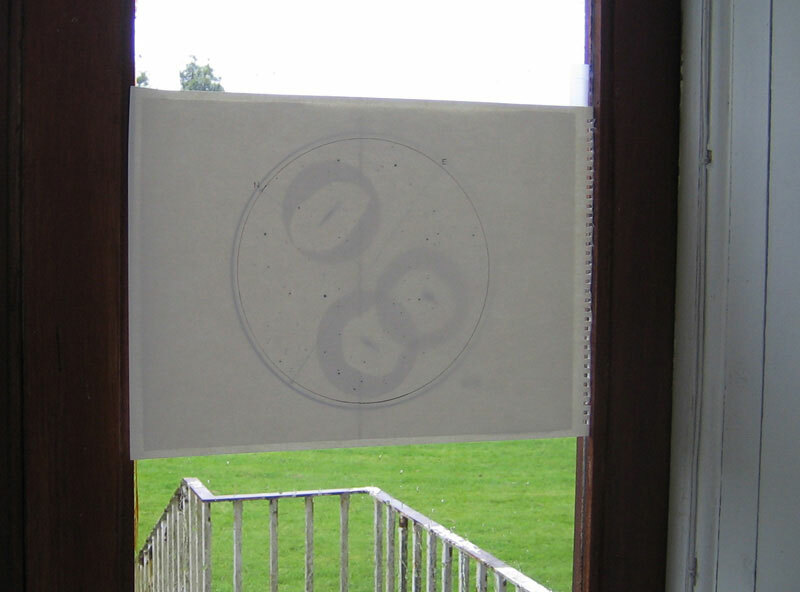 The printouts were taped together with the final 12” x 16” sketch paper, and the field stars and galaxy positions were traced with the help of backlighting from a window. I then copied the galaxy details by hand from the original sketches. There’s a bit more noise in the final result than usual because the larger format wouldn’t fit my scanner and I had to take a picture of it with my digital camera. M81 and M82 are an impressive duo. But a lot of people don’t know that there is a third galaxy in the neighbourhood (NGC 3077, magnitude: 9,8, surface brightness: 13,2). Even in a small telescope (like my 2,75 inch refractor) you can easily see a lot of detail in this trio. M81 is the biggest and best visible of the three, M82 is a little less bright than M81 and NGC 3077 was only visible with averted vision. Nice are also the differences in form. 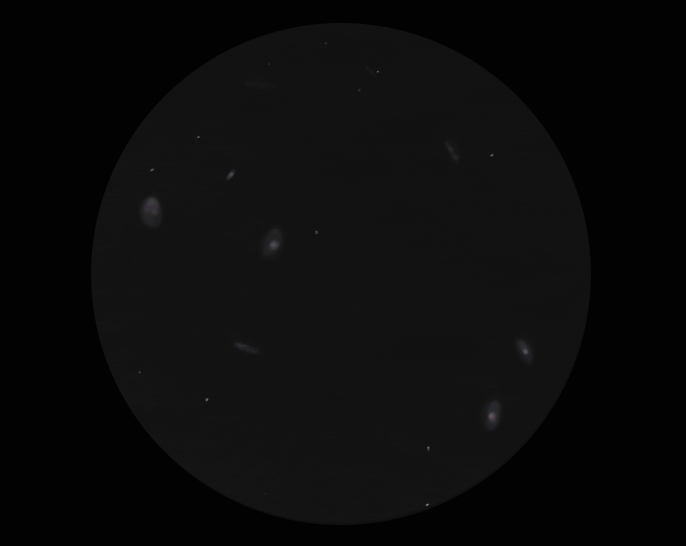 NGC 3077 is round, M81 is oval (elongated NW-SE) and M82 is oblong (elongated NE-SW). M81 is the only galaxy with a bright nucleus and a big difference in brightness between the core and the outer halo, M 82 has a less difference in brightness and NGC 3077 is uniform, without any detail. The problem making this sketch was that I couldn’t see the three galaxies at once in the wide angle eyepiece. To see the edge I had to look around the corner. This made it (for me) difficult to position the stars. Normally I limit a sketch to the field of view I can see at once. 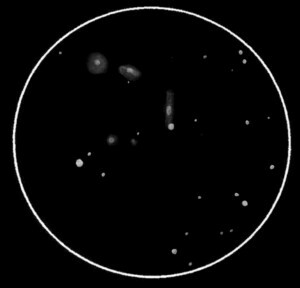 Once inside I made some brightness adjustments to the stars and finished the galaxies with the use of a blending stump (at the eyepiece I work with contour lines). After scanning I did some cleaning up with Paint. I hope you like this “Ursa Major Triplet”. These are galaxies M86, M84, NGC 4387, NGC 4388, NGC 4402, NGC 4413, NGC 4425, NGC 4438,and NGC443. I made this sketch in Pyrnik (Poland) on 17.04.2009. 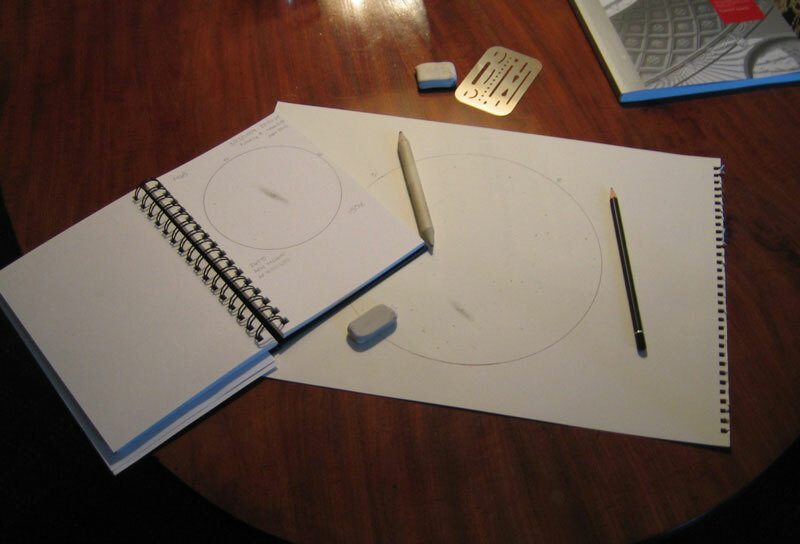 I used telescope Sky Watcher 12″(newton), LVW 22mm, pencil and paper. I had beatiful, black country sky. If I do say so myself the result is pretty impressive, what do you guys think? 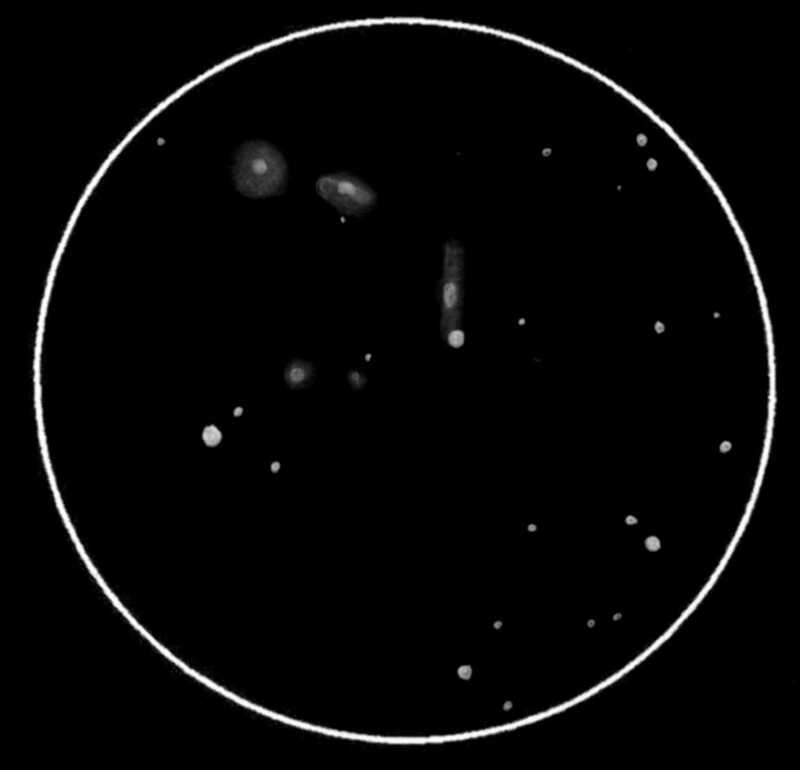 I thought this made a particularly interesting view as the galaxies are quite varied even though there’s not really any structure visible in my instrument. From the top, we have NGC499 which presents an elongated, well-condensed core, followed by the bright over/under pair of NGC508 and 507, both of which present semi-stellar cores. 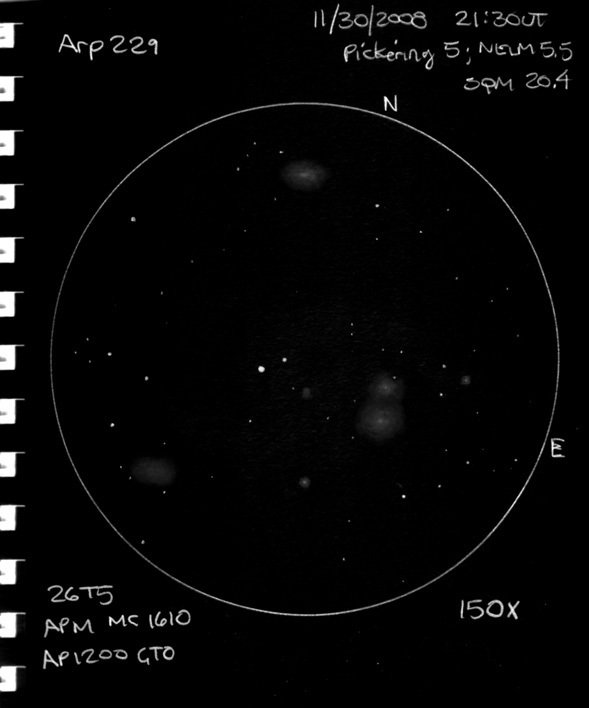 The little guys around that pair, clockwise from the center of the sketch are IC1687 with no core visible, MCG+05-04-048 with a dim semi-stellar core visible, and NGC504 with a bright stellar core. Lastly is IC1685 in the lower left, which is quite bright but shows no core at all. 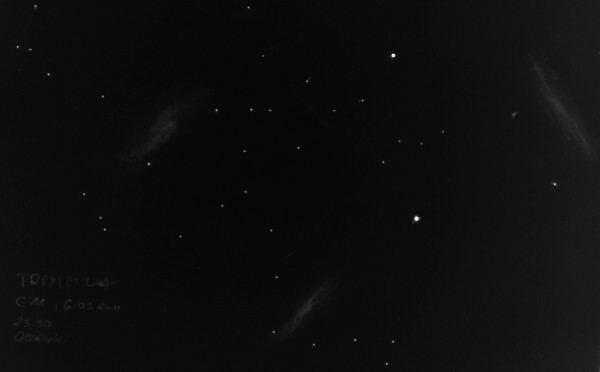 as viewed through a 16” Mak-Cass @ 150X; Pickering 5, NELM 5.5, SQM 20.4. Daler-Rowney HB Graphic pencil on white cartridge paper. Scanned and inverted in Photoshop. 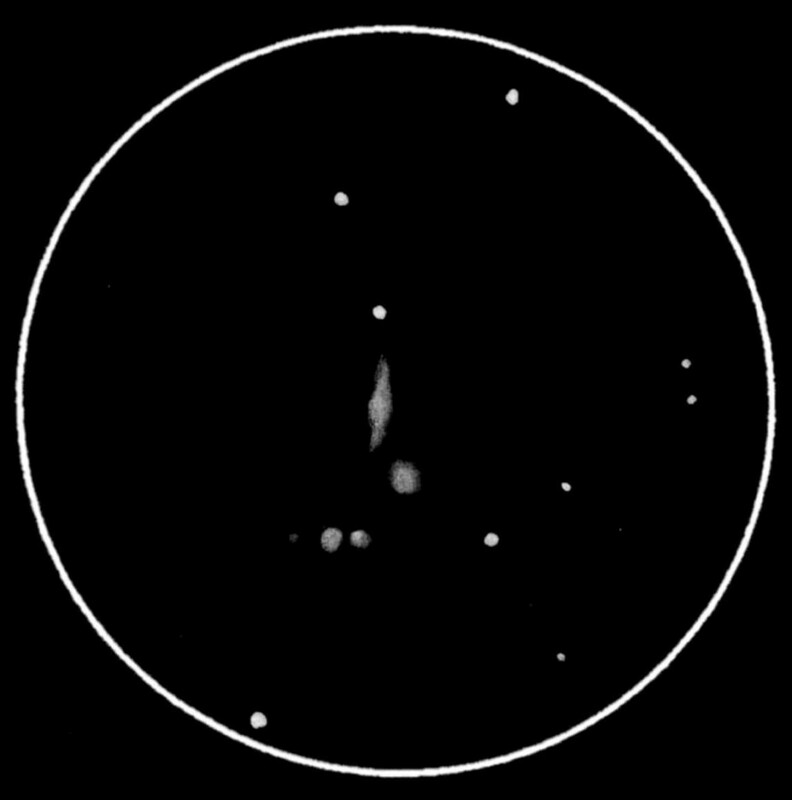 Here’s something a bit off the beaten path: Arp 331, comprising a string of NGC galaxies in Pisces. 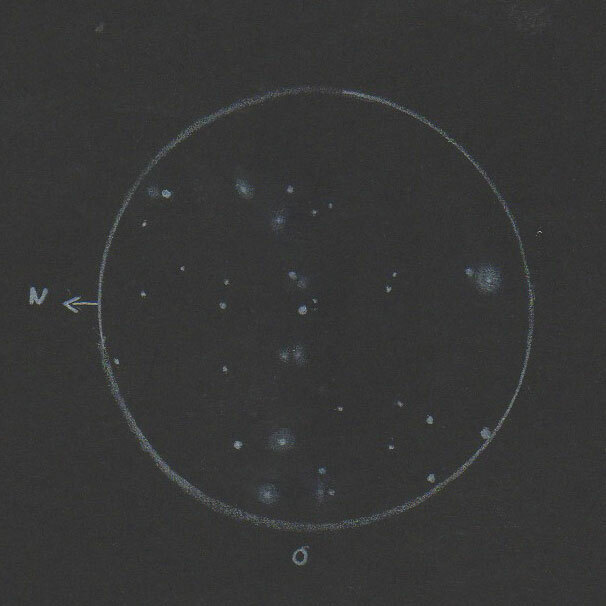 My sketch shows NGC383 in the center, with NGC380 and then NGC379 to the N. Somewhat dimmer are NGC385 and NGC384 to the S, with the averted-vision-only NGC386 in between (the dimmest one captured on the sketch). I missed NGC382 (which was too close to NGC383 to differentiate), and NGC388, which was too dim for my instrument and conditions. This remarkable sketch was made by Eiji Kato using a 47 cm. f/4 reflector and looking out to a distance measured to be 114 to144 million light years. These beautiful, large, interacting spiral galaxies are located in the constellation of Canis Major at R.A. 6 hrs.16 min.22 sec. ; Dec. -21° 22′ 21”. The smaller of the two IC 2163 is about the size of our own Milky Way galaxy. Both members were discovered by John Herschel in 1835. Supernova hunters may be familiar with this pair since the brighter, larger member NGC 2207 has been the site of three supernovas in the past 33 years. 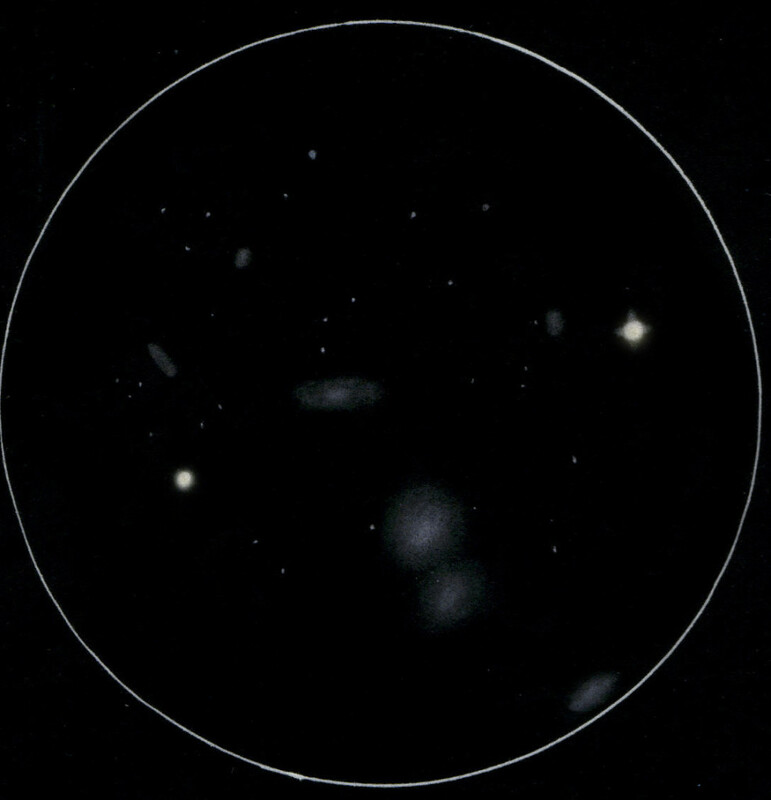 The visual magnitudes of these galaxies are 12.2 (IC 2163) and 11.6 (NGC 2207). The nuclei of theses spirals are about 1.4′ of an arc apart. In time, galactic cannibalism will complete the merging of this pair.